First up was the Hudson Warehouse company with The Winter’s Tale. Tom thinks this is a strange play, I find it perfectly straightforward (if a little bipolar), but having very much enjoyed one of their performances last year we were keen to see what this one was like. They play on the steps of the Soldiers’ and Sailors’ Monument in Riverside Park, cushions are provided, and it’s a lovely spot to spend a summer evening. Sadly we both felt that this performance didn’t quite live up to the standard we were expecting. The acting was patchy, and it wasn’t helped by a terrible sound system. However, it was a beautiful night to be in the park, we had a tasty picnic beforehand, and one of the local red-tailed hawks dropped in briefly to scrutinise the proceedings from a branch just above us, so it was still a pleasant evening. 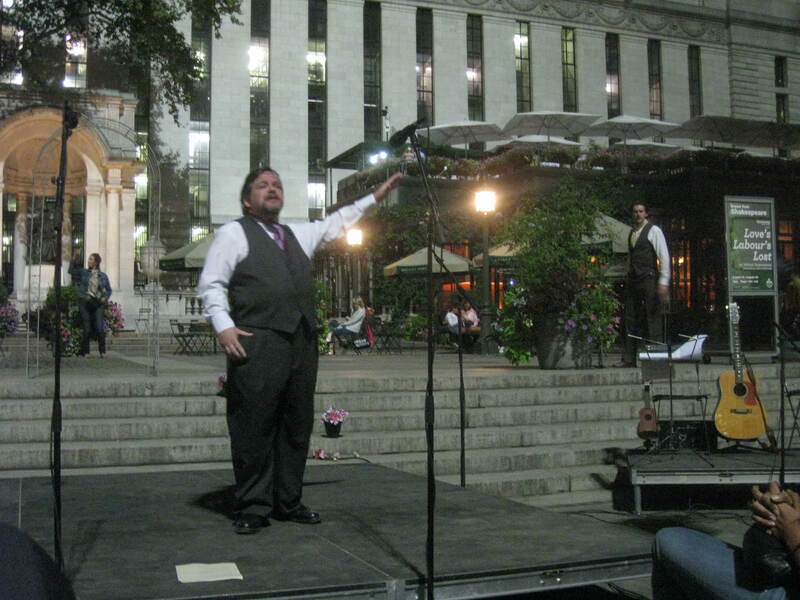 Next was the Boomerang Theatre Company with Love’s Labour’s Lost in Bryant Park. This was an excellent production which we thoroughly enjoyed, and not only because it was performed in European accents. All of the actors were superb, the men of the court gave an excellent upper-crust British whilst the French ladies were delightful, and the comedy Spaniard a highlight (meanwhile the Scots accent gave some difficulty, and Cockney was a complete failure as it migrated to Australia by way of Essex, with a brief sojourn somewhere in the vicinity of Ireland). Part of the delight was the way in which the actors used the space, strolling to and from their offstage area interacting with passers-by along the way, hiding behind the ornamental planters when necessary, and in one case even roaming around the audience delivering lines and sitting amongst us. Finally we retreated inside, to a black box theatre on East 13th street, for the Dell’Arte Opera Ensemble and their superb production of Purcell’s The Fairy Queen. A Midsummer Night’s Dream is one of my favourite plays in any case, and I love the music of Purcell, so really they would have had to work hard to make me dislike it, but it was genuinely very good indeed (even the New York Times critic enjoyed it). 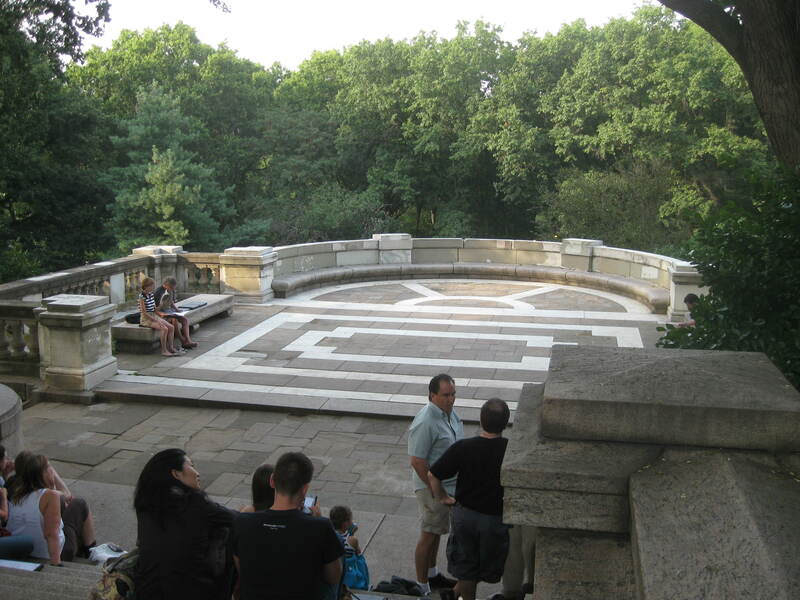 Set loosely in modern-day New York, mainly in Central Park, there were a few nice updated touches – the Athenians were clad in “weeds of Brooks Brothers”, for example – but the music was played by a period ensemble and most of the language was original. (That said I was a little confused by a brief snippet of The Importance of Being Earnest appearing mid-way through the Pyramus and Thisbe rehearsal segment, but it was extremely well done, and worked perfectly with the available cast as a substitute piece of dramatic silliness). The fairies all sang beautifully, and filled the minimal set with all kinds of evocative movement. Two dancers did tremendously well performing in the limited space available to them, although I did feel that ballet is better appreciated from far enough away that you don’t see all their bones and sinews at work. All the actors were well-cast and spirited, though Puck was particularly good. Having learned some of the Fairy Queen music from a songs-only score years ago I hadn’t realised quite how much of the Shakespeare text was performed – essentially the whole play with musical interludes interspersed throughout. Apparently they had cut some of the orchestral sections and abbreviated some of the songs, and with a three hour running time that was probably for the best, although I could have happily listened for longer. 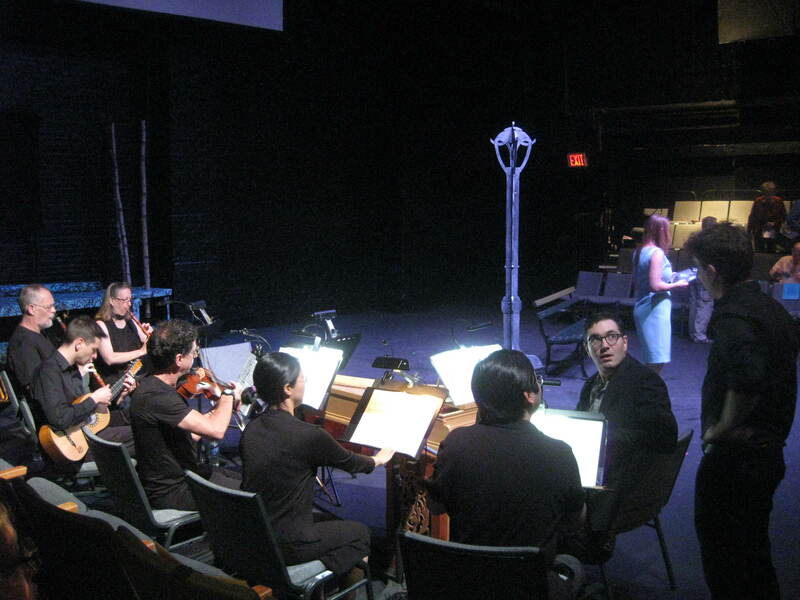 This entry was posted in Living, Music, Uncategorized and tagged Purcell, Shakespeare, theatre by Emma Davidson. Bookmark the permalink.